As promised, here’s a quick guide that will allow you to prepare for my “Test your code like a pro – PHPUnit in practice” tutorial at PHPNW12 conference in Manchester on 5th October. If you still haven’t decided whether to go or not have a look at the official abstract and my previous blog posts. There is still time to get the tickets! There are really 2 things that you will need, to get smoothly through the tutorial: git client and working installation of PHPUnit. So please make sure you have installed them and you can use them. Being able to open PDF files is also recommended as I will be giving out a tutorial’s manual/instructions in a PDF format. Well this above obviously requires a computer. I guess you will decide to bring a laptop with you, although if you prefer to take your desktop computer with you, it will do too. While most of the stuff will be in the PDF file, going through the tutorial without a laptop will be difficult to follow and you will not learn as much. I will not have any spare laptops to borrow, sorry. I strongly discourage brining in a Windows machine with you, unless you feel comfortable with solving any problems related with php, pear and PHPUnit in a very short period of time or you come really well prepared. We will not have a lot of time to spend configuring each other machines and we also don’t want the others to wait and do nothing while you set everything up. We only have 3 hours, and believe me it will go fast. You can install git client on a Windows machine by using the installer package that you can download from msysgit project downloads page. Just accept all the default options. All you really need is to be able to clone a repo and change branches. First download PHP 5.4 binaries from http://windows.php.net/ and unzip it into c:\php. Then download xdebug library from xdebug downloads page and copy it over to c:\php\ext directory. Rename the library to php_xdebug.dll. Next we have to install PEAR. Finally it’s time to install PHPUnit. At this point just running the below should set you up. PHPUnit 3.7.0 by Sebastian Bergmann. I hope this short guide will let you come to my tutorial well prepared. I will see you in Manchester soon! I’ve got some good news for the people that already have decided to attend my tutorial “Test your code like a Pro – PHPUnit in practise” at PHPNW12 conference in Manchester. Chris Hartjes has kindly offered to give away 3 digital copies of his famous “Guide To Building Testable Applications in PHP” book to attendees of my tutorial! I strongly believe this will nicely compliment the tutorial itself and give the people such a boost in their further adventures with testing. You can learn more about the book itself at http://www.grumpy-testing.com/. Your still have a chance to get a ticket to my tutorial on 5th October and only one more reason to buy it! 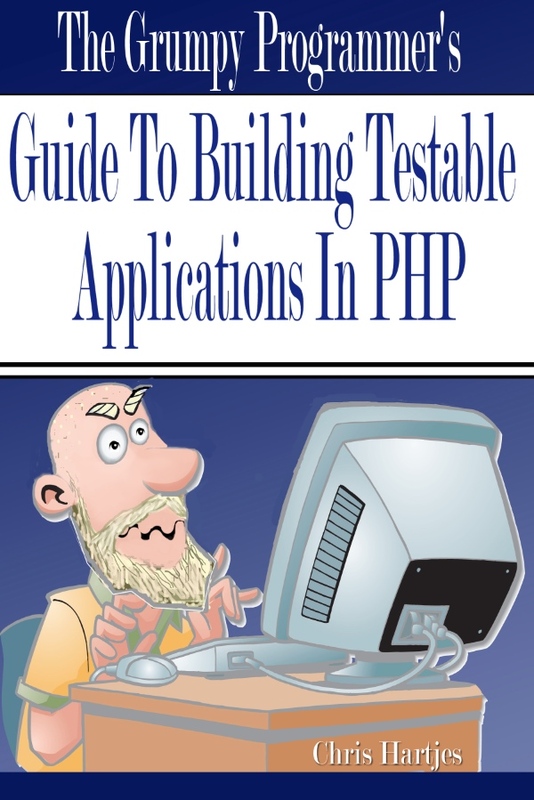 For these who already know PHPUnit and already have started they journey through unit testing PHP code I strongly recommend buying the book and reading it. There is plenty of hints and tips that will help you understand how to write unit testable code and increase its quality! Big thanks to Chris again and I hope to see you all in Manchester soon! PHP NW12 conference is nearly upon us, so I guess it’s about time to tell you more about the workshop that I will be having there on the 5th October morning. I wanted to do that for a very long time, especially that I am a big fan of quality assurance in software engineering. You can read the official abstract at the conference homepage, but here I am gonna tell you a little bit more about what we gonna do during the 3 hour tutorial. My main focus will be to teach you and lead you through main concepts of unit testing PHP code. It’s a beginners course, so we will go though all the basics of organising your test suite, understanding the benefits of unit tests and making you feel comfortable and confident with the code you write. We’ll do it all big band TDD style – so we will write the tests first and implement the functionality afterwards. It’s very important to get this right and to set up the mindset from the very beginning. If you have never had a chance to unit test your code, but you’d like to try now, it’s the best time to get started. I will do my best to make you feel confident and to help you start your own Journey Towards Continuous Integration, but what you have to do is to go to your boss and convince him to buy you a ticket to my tutorial ( and the conference). There is still plenty of time and there are still some tickets left. No matter whether you have already bought a ticker or you’re thinking about right now, if there is anything specific you you want me to go through during the tutorial please let me know. I’ll do my best to fit that in. We can also change the course of the tutorial if the group will prefer to touch on some slightly different subjects of unit testing – I am open for suggestions. And I will be accessible after the tutorial too, for any questions, help or even quick hacks. You will even get more chances to speak to me over the next 2 days, during the main conference days – on the 6th and 7th October. It’s a lot of things to go through so it is very important that you come prepared and focused on the day. We only have 3 hours and I’d like to avoid situation where the hardware/operational issues will stand in our way. While I will try to help everybody out if there are any issues I will encourage you to install PHPUnit on your laptops before, so it is working without a problem. I want to focus on writing the tests and using PHPUnit, not on trying to make PHP itself working on your machines. I strongly recommend using a non-Windows system. Windows has been proved to be very unreliable if it comes to setting up PHP and PEAR. It does work, but it requires some strong skills and patience. So you’d rather install ubuntu or debian, as this is an environment that everything just works out of the box. During the course of the next 2 days I will post more detailed instructions about how you can prepare your laptops to make sure you can run PHPUnit on them without any issues, so watch this space closely. I hope to see you at my tutorial in about 3 weeks!